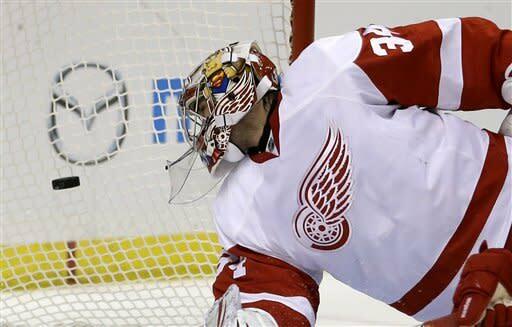 ST. LOUIS (AP) -- Petr Mrazek showed the composure of a seasoned veteran. The 20-year-old goalie made 26 saves in his NHL debut, leading the Detroit Red Wings to a 5-1 victory over the St. Louis Blues on Thursday night. Detroit halted a two-game skid with its second win in three tries against St. Louis this season. The Blues, who beat Detroit 6-0 on Jan. 19, dropped their third in a row. They have lost three successive games in regulation for the first time since Feb. 27 to March 5, 2011. 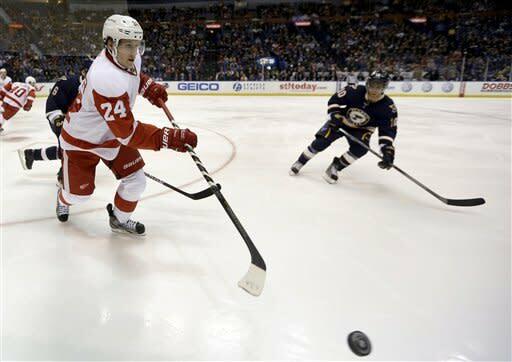 Daniel Cleary and Jakub Kindl scored first-period goals for the Red Wings, who beat St. Louis 5-3 in Detroit on Friday. Cory Emmerton and Damien Brunner added second-period goals 91 seconds apart. Mrazek, recalled from Grand Rapids on Monday, stopped the first 14 shots he faced. He used a cool, calm demeanor to stymie the Blues down the stretch, making 10 saves in the final period. Jimmy Howard, the team's No. 1 goalie, was given the night off after starting the first nine games of the season. Mrazek came through with an impressive effort, stopping the final 11 shots by the Blues. Mrazek allowed a second-period goal to Alex Pietrangelo, but was perfect the rest of the way. Detroit jumped out to a 2-0 lead in the first 11:50. Cleary scored on the rebound of a shot by Tomas Tatar at 5:14 of the first period. Kindl then snapped a wrist shot past Brian Elliott. Elliott, who fell to 3-4-0, was pulled from Tuesday's 6-1 loss to Nashville after giving up four goals on 11 shots. Pietrangelo cut the deficit to 2-1 with a power-play goal. It was the Blues' seventh power-play goal against Detroit this season. Detroit answered 1:48 later on a goal by Emmerton. Brunner then pushed the lead to 4-1 with his fifth goal of the season. Valtteri Filppula added an unassisted goal in the third, giving the Red Wings five different goal scorers. Drew Miller had two assists for the Red Wings. St. Louis won six of its first seven games before dropping three in a row. The Blues have lost their last two home games by a combined 11-2. The struggling Elliott has given up nine goals on 40 shots in his last two games. NOTES: St. Louis D Wade Redden appeared in his 1,000th NHL game. 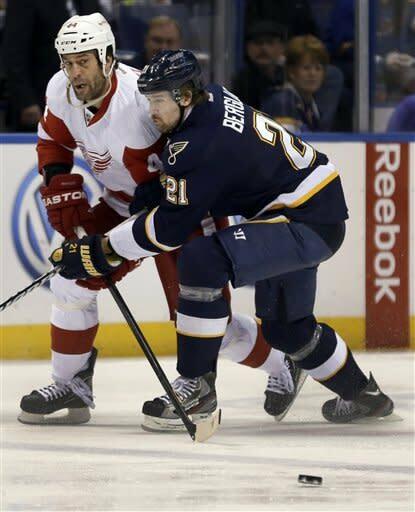 ... Detroit LW Henrik Zetterberg extended his point streak to seven games with an assist on Brunner's goal. Zetterberg has 12 points in his last seven contests. ... Detroit has scored in the first period in just three of 10 games. ... The teams played three times in the first 10 games and will meet two more times this season. ... St. Louis has scored at least one power-play goal in its last four games. ... Mrazek complied a 16-7-3 record in the minors.